For the past 10 weeks our dojo has been helping two of us prepare for our belt tests. Linda tested for 3rd kyu and I tested for 1st. I decided to blog about my experience, more from a perspective of what kind of insight this experience gives me. consistency, gentleness and good technique. I think with out the first and the second, the third does me no good. I need to be consistent and I need to be gentle in my approach and manner in all that I do. After the test the testing board brings us out to talk about our test. I was very pleased when Sensei specifically remarked about my consistency throughout the test. I had been training with a san dan at our dojo who agreed to be my uke. At literally the last moment, (we were in the middle of rolls warming up for our test) he said to me that his back was bothering him to the point where he could not be my uke. My uke has talked about doing the best with what’s given you. This was an opportunity to do just that. We are a small school so to replace him, I went through most of my dojo mates that came that day to watch. My son Steven even uke’d for me on a few techniques. As we reviewed my test, Sensei remarked that I showed good flow regardless of who I worked with, and adjusted my techniques to be appropriate to the uke’s experience. I was very touched by his support and words. The board all had good things to say and I felt good about my performance. I have posted my test on youtube. i’m wondering if I will have an onslaught of “that stuff just won’t do against MMA.” comments. Here’s what I think about that: There were two peopl on our testing board that are up in their years. We have a woman who is 82. She does not train anymore but Sensei thinks enough of her to have her sit on our tests anytime she can. She is a testament to consistent training. We also have one of our black belts that still trains. He is 79, and still rolling around on the mat and throwing us with ease. I’m fairly certain that neither of these two fine people have had a fight in their life. However, when we see football players, wrestlers, and boxers who cannot train because of bad knees, hips or other casualties of their sport, we have people well into their 60s, 70s and 80s still training and still vibrant. This is of great inspiration to me. If you teach someone to fight, then that’s all they will do. However, if you teach someone to resolve conflict, become a bigger person, show love in the face of adversity, then you teach someone to tap into the greatness we all have. I am grateful to my Sensei, my school and uke for their gracious support. 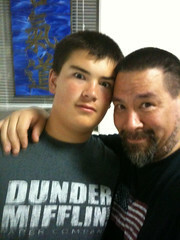 I’m grateful to my son for his wondrous and unflinching support of his dad. Last but not least, I’m grateful for having a wonderful and amazing woman that has been there for me, cheering me on, inspiring me and loving me through this experience. Leah, you are my sun, moon and stars. This has been a whirl wind couple of weeks. We have been really busy at work and I did not have a chance to train this weekend. I am taking advantage of the classes yesterday, tonite and thursday before my test. Good technique – I want to be able to demonstrate good form in my throws and techniques. The basics of any artistic or physical expression stem from good technique. Flow and consistancy – I want to feel a connection with my partner and exhibit zanshin, awareness throughout the test. This means that as I finish one technique I still keep focus on uke and hold that focus till we bow out from our testing. Most importantly, the spirit of loving protection – I’ve read once that the spirit of loving protection means that when we are in a conflict situation, we not only strive to protect ourselves from harm, but we strive to protect our attackers, even as they seek to hurt us. I want to encompass the spirit of loving protection and exhibit how this can be done on the mat. If I can practice these things on the mat, then I can learn to work this into my life, just that much more. Tonight was an interesting and wondrous night at the dojo. I came in to find Charlie, one of our teachers, standing at the window. I asked him how he was doing and he said he had come down with a bad cold. He felt that he didn’t want to touch the mats or have any human contact for fear that he would be contagious. He said, “You get to teach the class tonight…Lock up when you’re done…” Wow… I was scared and at the same time very appreciative of the opportunity. So, we had five people come today including myself. We bowed in, and started. As it turned out, we worked quite a few techniques, we did some suwari waza, worked in a line and worked some interesting earth and heaven energy, did nikkyo into irimi nage, and I think that I did a pretty good job on short notice! I tried to stick to the basics, and show what I knew, not what I thought I knew or what i thought Sensei or Charlie would teach, bu what I knew. The end result: I can see why people like to teach! It was a great and amazing opportunity! So, as I finished my second to last class before my test, I feel that tonight was a really great gift. I’m appreciative of my dojo mates for putting up with me, and I am still high from the experience as I type. Oh my my… I’ve been sick. I don’t think I’ve been this sick in a while. I had a brief reprieve last weekend, but relapsed for the next week. Aside from 2 hours at an Aikido seminar last sunday today was the first time I have trained in 2 weeks. Normally, every last Saturday of the month we have weapons practice. I thought that today would be a perfect day to come back and ease back into training… HA! Sensei decided that, since we are 3 weeks out from my kyu test, if I showed up, he would skip weapons, put the mats down and focus on test preparation. So much for an easy class to get back into the swing of things. I’m actually very touched that he would forgo our weapons practice to support our testing efforts. It’s one of the many reason I am a student of his. Today, we worked on koshi nage (hip throw) as well as techniques from hanmi handachi. In Aikido and some other traditional Japanese martial arts, there are a series of techniques that are performed on the knees. Suwari waza is performed where both partners are kneeling. 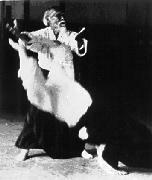 Hanmi handachi is performed with the attacker standing and the person performing the technique on their knees in tradiitional seiza position. I’ve blogged about this a while ago as to the origins, but in brief these series of techniques where designed to defend against attackers coming in suddenly while the defender is conducting business, eating or sitting on the tatami mats back in the day when the traditional seiza position was the norm in Japanese culture. The practicality of defending one’s self against marauding hordes while in the middle of tea ceremony has past, but there are other reasons that we still practice these techniques. Techniques done from the kneeling position helps our standing techniques tremendously. Whatever weaknesses that we exhibit in a standing technique will be multiplied on the knees. Thus, if you can work better on your knees it will help the technique overall. Today we worked irime nage, and the omote and ura versions of shiho nage. In anything we should measure our success by the progress we make, small or large. Shiho nage has been a strong technique for me standing, but in hanmi handachi, I seem to be all left knees. Today, I was getting it. I felt strong and sure today. It felt like technique flowed really well. My son, who has his second degree black belt in Tae Kwon Do, was happy a while ago because he just nailed his first 540 degree spin kick. Today, I was happy that I could feel shiho nage, so it’s all relative. The point being, progress is always good at any level. Road to 1st Kyu – week 6 Day 1 – if you can still inhale…. …I will keep on practicing, not for the prowess in self-defense, not for rank or prestige, not even for the wonderful and life-changing lessons that flow from this art. I will practice Aikido for the sheer, unmitigated beauty of it. OK, I’m sick. My son brought home a cold the week before and I caught his. I got bad Wednesday, felt better Thursday, better yesterday and relapsed today. Apparently a frog has decided to possess my vocal chords and i’m hacking and coughing. Hence, I did not want to infect the dojo so I haven’t trained all week . I’m unfortunately missing a seminar today with Nadeau Sensei and Heini Sensei that I really wanted to go to. If by some strange circumstance I feel better tomorrow I will take Steven and head over. They have a session from 10 to 12. It’s a nice place to be. I believe that the lessons we learn on the Aikido mat help us in other aspects. Thich Naht Hanh said, “if you can still inhale and exhale for that moment, you know you are OK.” I’ve said before that Aikido is a microcosm of the world, so if I can be still and OK with however way my test goes, then I can be OK with other aspects of my life. I can know that regardless of the situation, I’ve given it the best of me. So, hopefully I will feel better tomorrow. It would be regrettable to not get some training in this weekend but it’s not the end of the world. 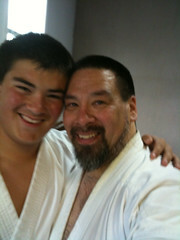 I’ve not been on the same mat as Nadeau Sensei in probably 20 years. There’s always another seminar though. If not tomorrow, then sometime soon. Oh, and by the way. I’m trying out the kindle app for Windows Vista on my laptop. Before I bought anything crazy like an Apple Ipad (out next week) I wanted to see as to the readability of the kindle app. The quote I found was from George Leonard’s book, “The Way of Aikido, Life Lessons from an American Sensei.” I like that he has such a simple and down to the point writing style. More so, I really enjoy the quote. Aikido is a beautiful thing; whether realized on the mat, used to evoke a creative outlet, or to calm a not so calm situation.